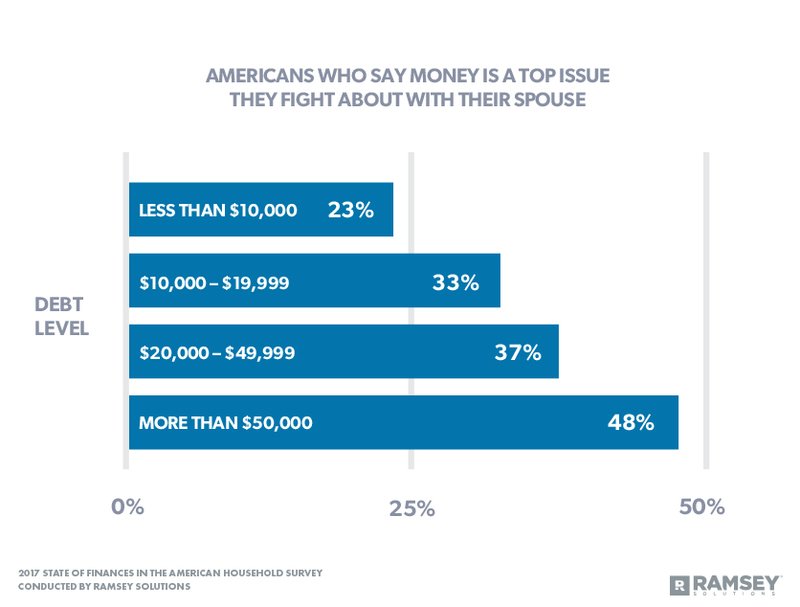 Money is the number one issue married couples argue about. 86% of couples who got married in the last five years started out in debt. The higher a couple’s debt burden, the more likely they are to argue about money. 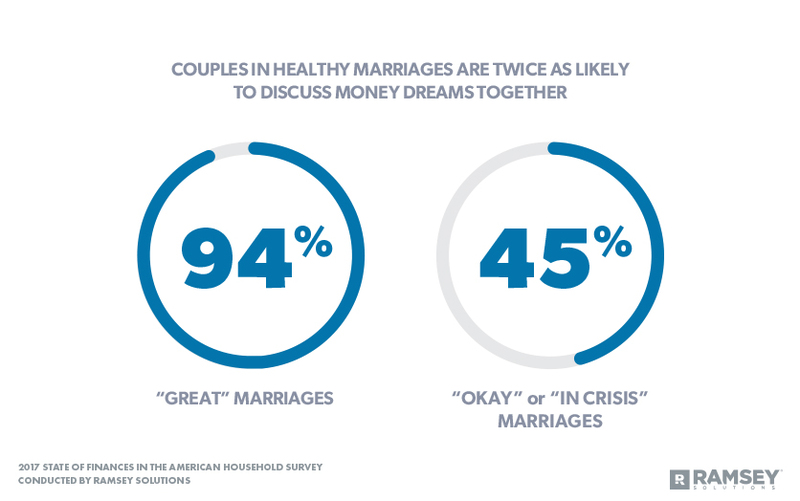 Couples in healthy marriages are much more likely to talk about their money dreams and make long-term money goals. If you and your spouse argue over money, you’re not alone. It’s the number one issue married couples fight about. In fact, money fights are the second leading cause of divorce, behind infidelity. 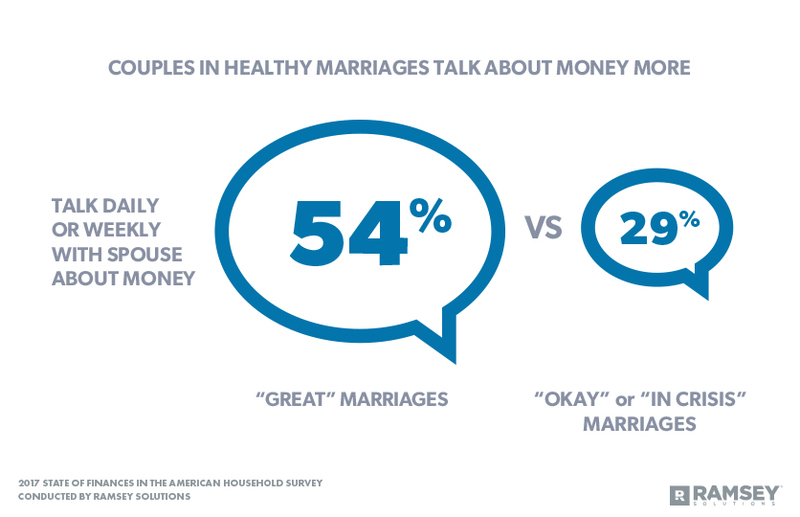 In late 2017, Ramsey Solutions conducted a study of more than 1,000 U.S. adults to gain understanding of personal finance behaviors and attitudes, as well as how married couples communicate and relate about money. So, why are couples fighting about money so much? A peek into their bank accounts may provide an answer. Couples who fight about money have roughly $30,000 in consumer debt on average, with nearly two-thirds (63%) of all marriages starting off in the red. 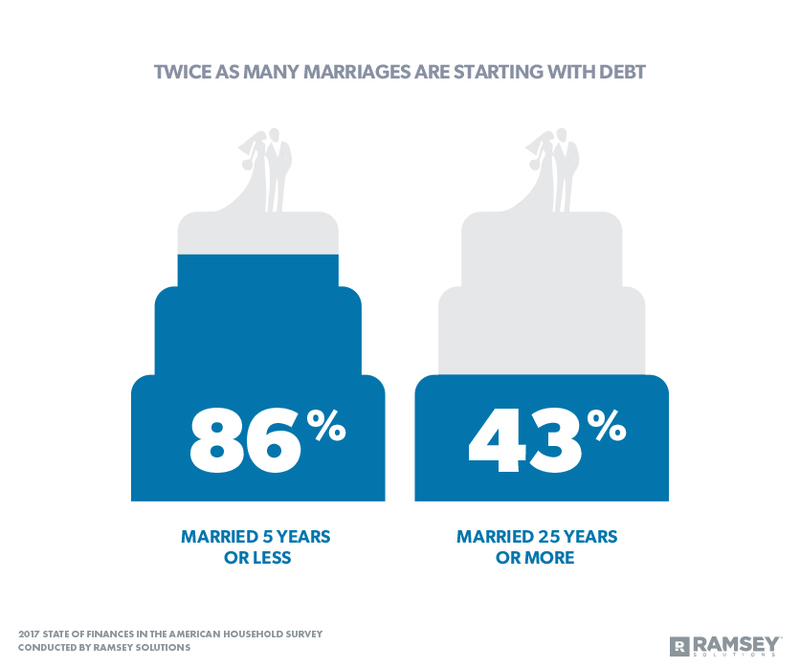 That debt load is having a negative impact on marriages, regardless of household income. Forty-one percent (41%) of couples who have consumer debt say they argue about money—and it’s what they argue about the most. In comparison, only 25% of couples who are debt-free say they argue about money. Plus, money doesn’t even make the top-five list of things debt-free couples argue about. Bringing debt into marriage is trending upward over time, with younger generations having much more debt than the generations that came before them. Forty-three percent (43%) of couples married more than 25 years started off in debt, while 86% of couples married five years or less started off in the red—twice the number of their older counterparts. Not only that, but more couples in the younger generations accumulated debt to pay for their wedding than older generations. Forty-one percent (41%) of those married five years or less say they felt pressured to spend more than they could afford on their wedding. Over half (54%) of couples married five years or less say some of their wedding expenses were covered with a credit card—and 73% of those couples say they regret that decision. “Couples who are just starting out need the best foundation possible if they’re going to have a strong, long-lasting marriage. Unfortunately, debt keeps couples in the past and prevents them from focusing on their futures,” said Rachel Cruze, #1 New York Times best-selling author and personal finance expert. The larger a couple’s debt, the more likely they were to say money is one of the top issues they fight about. Almost half (48%) of couples with $50,000 or more in consumer debt say money is a top reason for arguments. And those with $50,000 or more in debt were three times more likely than couples with less than $10,000 in debt to say the tone of their money conversations is negative. Debt is not the only financial pain point for couples. 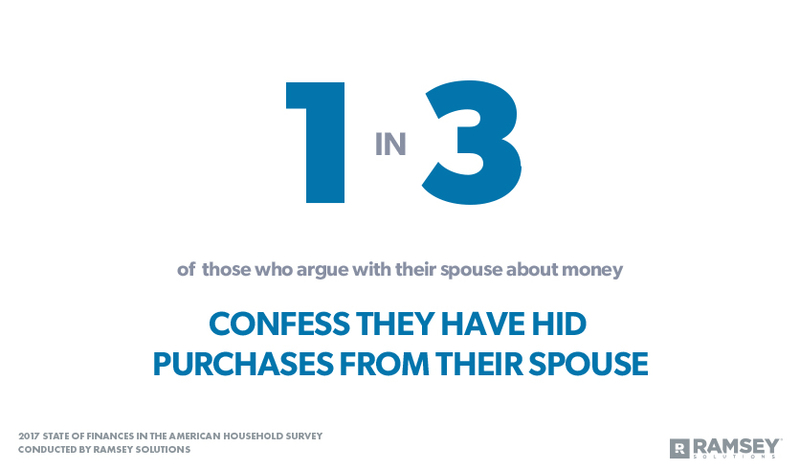 One-third of people who say they argued with their spouse about money say they hid a purchase from their spouse because they knew their partner would not approve. “Financial infidelity is more prevalent than people think,” said Cruze. “Couples who take a team approach to their finances are more likely to achieve their goals. Doing a monthly budget together and talking about it regularly are the first steps in making that a reality. These budget meetings open the door to more meaningful conversations about their dreams,” said Cruze. Emotions surrounding money—especially debt—may be one of the barriers between spouses when it comes to talking about their finances. Almost half (47%) of respondents with consumer debt say their level of debt creates stress and anxiety. Sixty percent (60%) of those with consumer debt say they worry about finances monthly, and one in four say they worry about finances every day. Respondents are also anxious about talking about their personal finances, especially if they carry a higher debt load. Sixty-three percent (63%) of those with $50,000 or more in debt feel anxious about talking about their personal finances. Comparatively, 41% of those who have less than $10,000 in debt have that same anxiety. Not only is debt causing anxiety, but it’s also causing embarrassment. Forty-three percent (43%) of respondents with $50,000 or more in debt feel embarrassed about talking about personal finances compared to only 10% of those who are debt-free. There is hope for couples who want to work on better communication around money. When couples get on the same page—through talking regularly, making money goals, and discussing dreams together—they build a strong foundation for their relationship. Working with each other (instead of against) reduces anxiety and fosters healthier relationships. “Talking about money is often more valuable than the money itself,” Cruze said. Ramsey Solutions is committed to helping people regain control of their money, build wealth, grow their leadership skills and enhance their lives through personal development. The company’s success is defined by the number of people whose lives are changed by a message of hope. Through a variety of mediums including live events, publishing, syndicated columns and a nationally syndicated radio show, Ramsey Solutions uses commonsense education to empower people to win at life and with money. Millions of people have gone through Financial Peace University classes across the country, and Ramsey Solutions’ world-class speakers have brought vision, inspiration and encouragement to over a million more. Named among Nashville’s best places to work ten times, Ramsey Solutions employs more than 650 team members focused on and dedicated to doing work that matters. As a #1 New York Times best-selling author and seasoned communicator, Rachel Cruze helps people learn the proper ways to handle money and stay out of debt. She’s authored three best-selling books, including Love Your Life, Not Theirs and Smart Money Smart Kids, which she co-wrote with her father, Dave Ramsey. You can follow Cruze on Twitter and Instagram at @RachelCruze and online at rachelcruze.com, youtube.com/rachelcruze, or facebook.com/rachelramseycruze. The State of Finances in the American Household is a research study conducted with 1,072 U.S. adults to gain an understanding of personal finance behaviors and attitudes, and how money impacts relationships. Attitudinal-based statistics include only those with an opinion on the topic. The nationally representative sample was fielded November 29, 2017, to December 5, 2017, using a third-party research panel. Consumer debt defined in this study as types of debt including: credit card debt, student loans, car loans, medical debt, home equity loans, 401(k) loans, and tax debt. Debt-free defined in this study does not include mortgage debt. Have questions about this study? Email us!